Apetit has developed the Responsible Farming method through long-term cooperation with its contract growers. 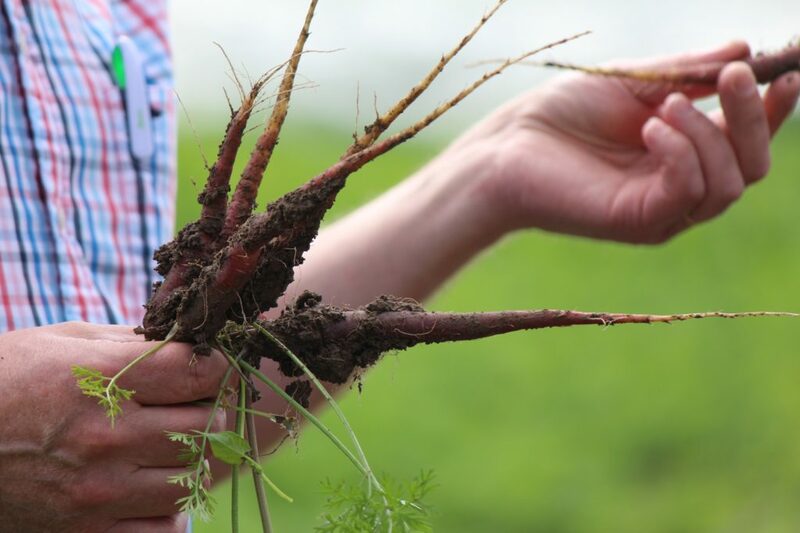 Apetit’s responsible farming practices mean we produce pure Finnish outdoor-grown vegetables with respect for nature. The aim is to maximise the quality, safety and eco-friendliness of cultivation. Each year, our approximately 100 Finnish Apetit contract growers produce more than 33 million kilograms of pure and responsibly-grown food for us. Careful timing ensures that the vegetables are harvested when at their very best. The training and experience of Apetit contract growers mean that they only use biological and mechanical plant protection measures where necessary. The measures are taken with careful consideration and timing. They are then reported at the plot-specific level, so that the origin of the products can be traced all the way from the field to the consumer product. The method covers general farming practices, plant-specific cultivation instructions as well as management of quality, product safety and environmental issues. As part of Apetit’s responsible farming practices, use of fertilisers is based on soil studies, preceding rotation crops and the crop being cultivated to ensure that fertiliser use is restricted to the amount required by the crops. This helps minimise potential nutrient run-off into nearby waterways. Under the responsible farming practices, plant protection measures are only applied as needed and at the right time, using biological and mechanical methods where possible. All plant protection measures are documented on the ViRe cultivation management system. The raw materials produced under Apetit’s responsible farming practices can be traced product-specifically based on their batch codes and best-before dates. Apetit’s responsible farming practices are based on the IP (Integrated Production) guidelines implemented by Apetit in 2000 and aimed at ecologically sustainable development. Under the IP approach, the development of cultivation, improving the quality of outdoor-grown vegetables and managing environmental impacts are implemented comprehensively in a way that takes multiple perspectives into account. The IP approach is based on plant-specific cultivation instructions and continuous development in cooperation between growers, Apetit responsible farming experts and researchers. In 2014, Apetit moved from the IP approach to the IPM (Integrated Pest Management) method, which represents an even more comprehensive approach to plant protection. Apetit’s responsible farming practices are developed continuously. The source of this development is Räpi, the Group’s own experimental farm in Köyliö, which has been in operation for more than 60 years. Our own experimental activities allow us to identify the best and most delicious varieties that are suited to outdoor growing in Finland, and also have the right characteristics for production of frozen food. Räpi experimental farm develops cultivation methods that support a sustainable cultivation ecosystem. Pest control solutions can include, for example, nets that cover crops, and information on pest life cycles and their natural enemies. Similarly, biodegradable covering materials and mechanical uprooting can be used to keep weeds under control. Modern technology is being utilised in ongoing studies focused on controlling weeds without spraying chemicals. The Räpi farm has made a significant contribution to the development of the Finnish IP (Integrated Production) method. In 2011–2013, it participated in the Varjellen Viljelty project by updating new plant-specific cultivation instructions in response to consumer expectations and regulatory standards. The Räpi experimental farm engages in close cooperation with various parties. Experimental cooperation with Apetit’s contract growers, on their fields, plays a significant role. The new knowledge and expertise developed at Räpi is transferred to Apetit’s approximately 100 contract growers in many ways, including the Experimentation Days event, which promotes agriculture as a livelihood throughout Satakunta.